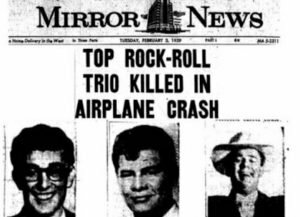 On February 3, 1959, a plane crash occurred in Iowa during a snow storm shortly after 1 am which killed three young rock and roll singers who would go down in history: Buddy Holly, Richie Valens, and J.P. “The Big Bopper” Richardson. 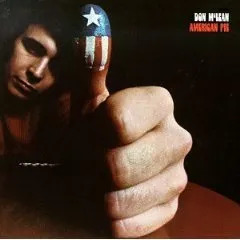 Their story would later be captured as, “long, long time ago” in the 8 1/2 minute hit song “American Pie” by Don McLean, released twelve years later in 1971. “February made me shiver… bad news on the doorstep” is the date of the crash. These performers were planning a 24-city “Winter City Party Tour.” The bus was so cold that Buddy Holly decided to charter a plane to the next venue in Fargo, N.D. But the plane didn’t make it. Richard Valenzuela, aka Richie Valens, currently had a hit with La Bamba. Buddy Holly had a number of hits, including That’ll Be The Day and Peggy Sue. His song Peggy Sue Got Married was later turned into a hit movie by Francis Ford Coppola, starring his nephew Nicolas Cage (Coppola). “The Big Bopper“, mentioned by Nicolas Cage in the same movie, was not the name of a hamburger, but the singer of the hit song Chantilly Lace. No, that’s an urban legend. The plane’s only designation was what was on the wing registration: N3794N. I just read something today that said that Buddy was having some financial woes and that he had to find work so he agreed to join this tour. Thanks for the question: the performers were on the eleventh night of their 24-day Winter Dance Party tour and had not been paid yet. Their bus had broken down once already and Buddy decided to charter a plane to the next location and asked others along between sets. At the time, Buddy Holly’s career had lasted a year and a half with only one number one single at the time of his death at 22, and accepted top billing for the tour as a way to dig himself out of bankruptcy. His pregnant “widowed bride” heard about the crash on the radio and collapsed. The next day she miscarried.